You cannot make it across the United States on ambition alone. On our journey we had the good fortune to be able to rely on support from a number of amazing sponsors. Being comfortable in all weather conditions, recovering as quickly as possible each night, and being visible were all huge factors in the selection of our Rapha kit. We worked closely with the team at Rapha HQ in Portland to chose a range of kit that would ensure we had what we needed to be safe and comfortable no matter what was thrown at us. A little of this goes a long way, but we were going a really really long way so we brought a ton. When you’re averaging 150 miles a day for nearly a month you can expect that your grundle is going to be sad. 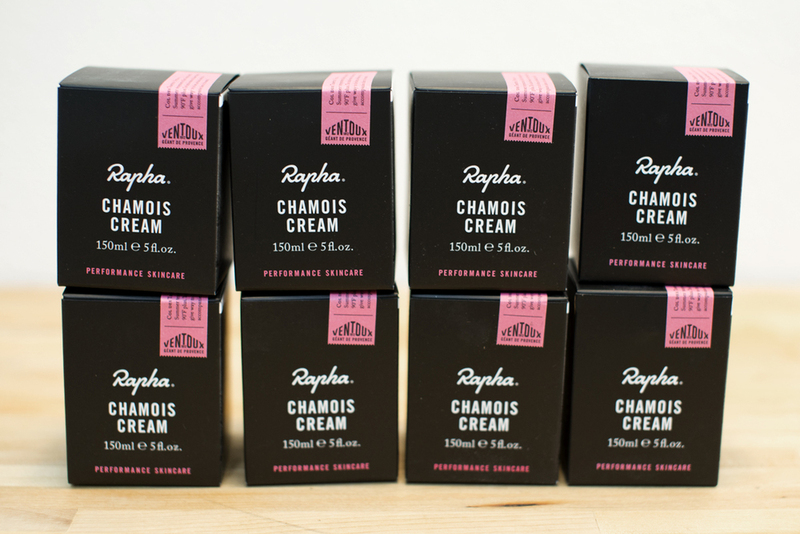 We went through tin after tin of this cream, which is formulated to work well with the Rapha chamois in all of their bib shorts. We selected kit from the Pro Team, Classic, Lightweight and Ultra Lightweight lines so that we’d have a range of options to choose from based on weather conditions. We’re both really different athletes, so we needed some room to make the choices that would keep us comfortable. The vibrance of the blue Pro Team Race Cape was really appreciated. This was awesome for visibility and breaking the wind through mountain passes like this 9584ft. ascent over the Continental Divide. This was one of the hardest days of the ride, and this photo of Michael completely shattered at the end of the day proves it. We awoke to 35 degree temps and pouring rain, in June, in the high desert. Insane. But we made it through by layering Pro Team Race Capes with the Hi Viz Gillet for protection from water, warmth, and visibility in the rain. And we rounded that out with merino leg warmers and merino socks. How many times did we race the sun and lose? We cannot recall, but it was often enough that these hi viz Brevet Gillets got a ton of use. They’re vented on the back, light enough that we didn’t need to worry about getting hot, and SUPER visible in all conditions. They were a staple of our wardrobe as the sun started to go down or if we hit foggy weather. It got hot. 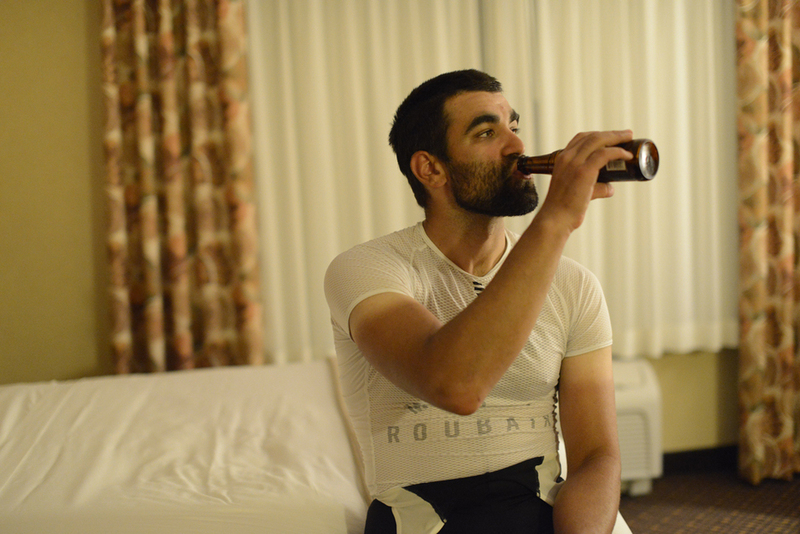 But the Pro Team jerseys and bibs and the Ultra Lightweight jerseys and bibs got us through the really hot days. 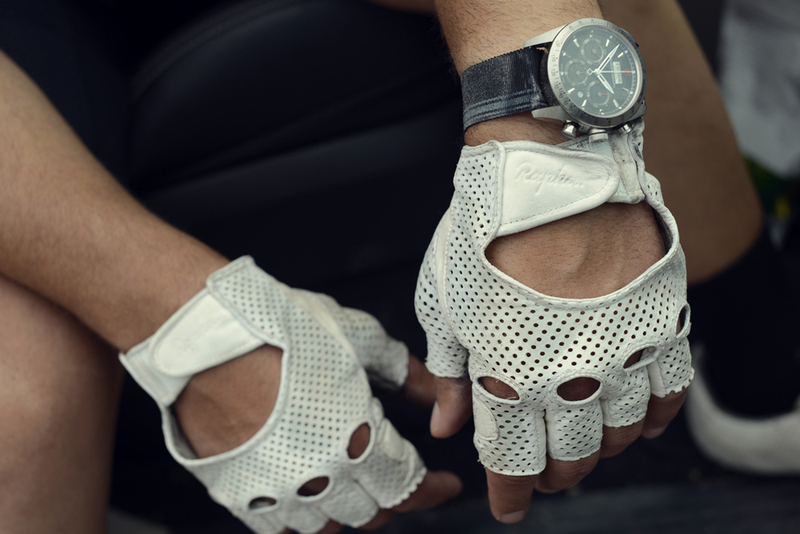 The Grand Tour gloves matched our Tudor Fastriders nicely, and were a great balance between protection, cushioning and style. Over time they transformed from brand new pure white to a soft & supple texture with a light tobacco coloring. Michael had worn a pair of Grand Tour shoes for about 8,000miles of training leading up to the departure of LIOTR, so he knew they were up to the challenge of riding 3,500 miles in 24 days. 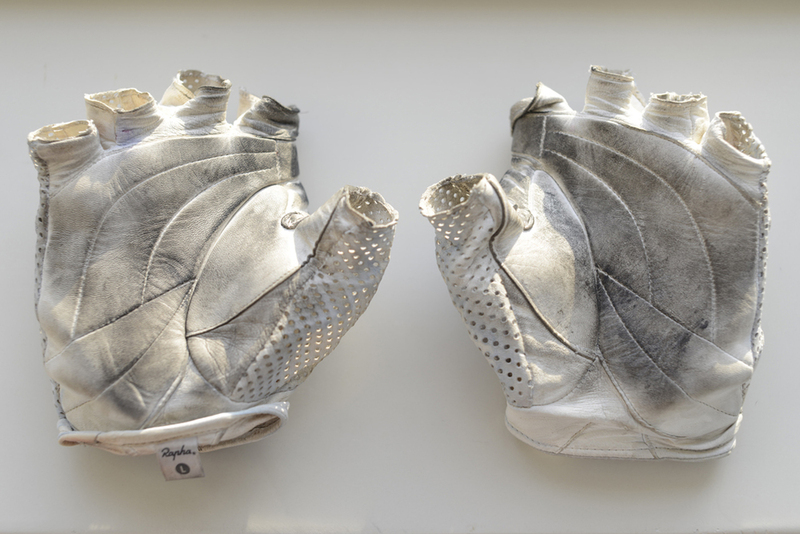 This pair began a new life on the Oregon coast on day one of the ride. We also close Pro Team socks for most days due to breathability. Stylistically Andrew went with short socks and Michael went long. On the hottest of days Michael still chose to wear this base layer because it was form fitting and breathable enough that it was barely noticeable on the skin, but it added an additional measure of protection against sunburn, bugs and road grime. Yes we were off the bike too, if only for a couple of hours. 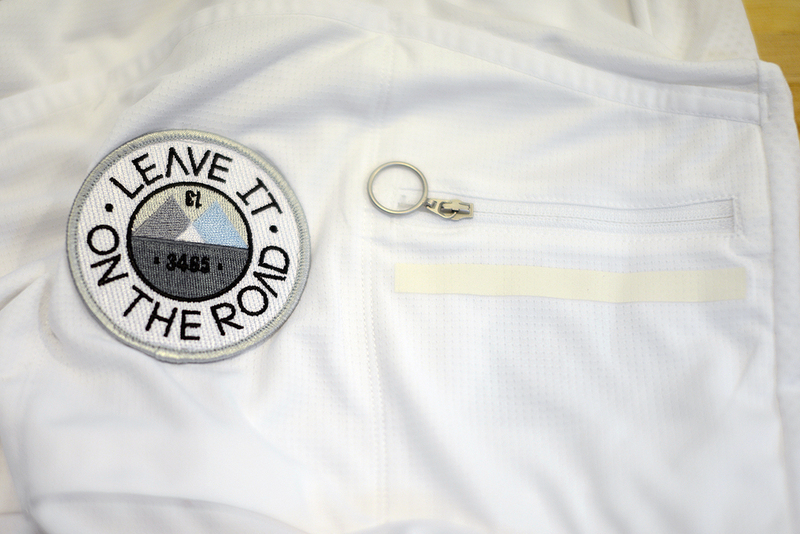 Off the bike we were outfitted with Rapha Logo T Shirts and Touring Shorts. One night we ate Mexican food at a tiny place somewhere in Ohio and an older couple came up to us and asked us what Rapha was. We told them about our ride, the sponsors, and somewhere in the middle of the conversation the bartender gave us a $20 bill and told us to add it to the donations. At the end of the day a shower and a shave (of the legs, obviously) was pretty much all we wanted. And food. But Rapha doesn't make that yet. We have to say a huge thanks to Rapha for their support on this journey. This was our fourth and most ambitious journey, and it was the first time that we were truly able to focus 100% of our efforts on riding and recovering, and we owe so much of that to their involvement and support. The gear performed flawlessly, were safe and visible, we stayed healthy, and we looked damn good doing it. We look forward to future partnerships as Leave It On The Road continues on to other adventures.